Just another bitterly cold day in Minnesota. 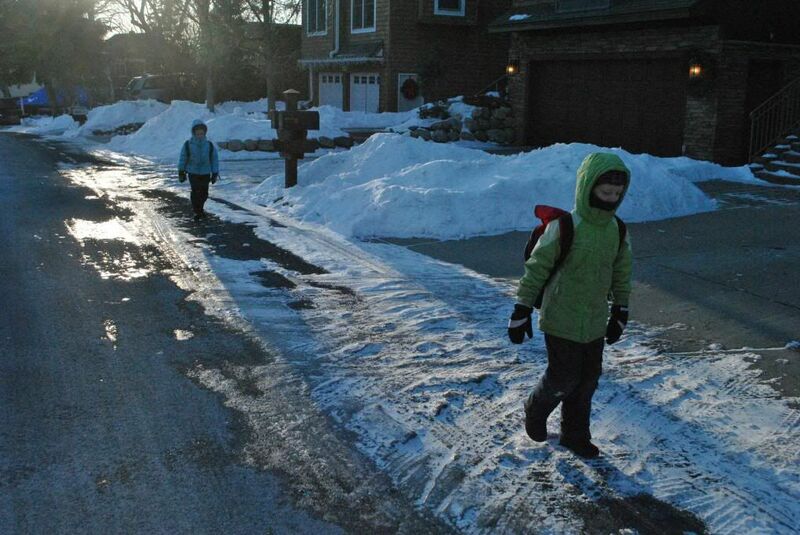 I woke up to my wife telling me that she's pleading for me to drive the children to school on Facebook. "A WIND CHILL ADVISORY MEANS THAT VERY COLD AIR AND STRONG WINDS WILL COMBINE TO GENERATE LOW WIND CHILLS. THIS WILL RESULT IN FROST BITE AND LEAD TO HYPOTHERMIA IF PRECAUTIONS ARE NOT TAKEN. 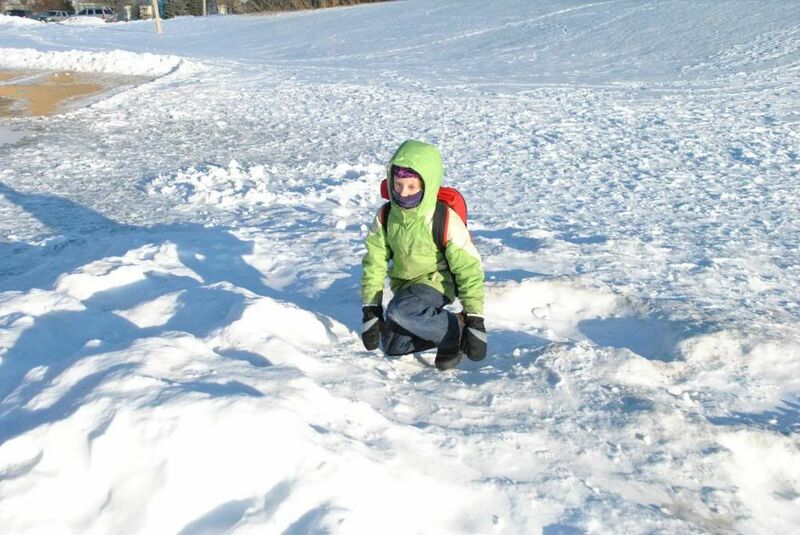 WHEN VENTURING OUTDOORS...MAKE SURE YOU WEAR A HAT AND GLOVES." So I reasoned that as long as they were bundled up properly (as they do every morning I send them off to school) they would be fine. Several of my wife Facebook friends clearly agreed with my wife (and one with me). In the end, I get to make the decision. So I walked to school with them. We got ready for school. 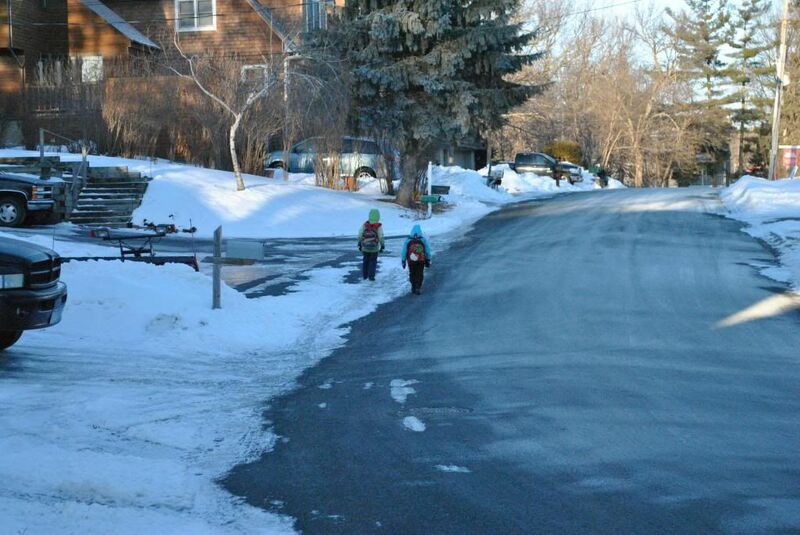 They were bundled up before I was, so I suggested they could start without me, and I would catch up. I figured they would rather stay with me in the warm house. However Cecelia said, "Ok!" and then told Maeve, "Let's hurry and try to beat him!" And off they went. Girls try to take off without me! Yes it was cold, but we had appropriate hat, mittens, and footwear. It was a rather pretty walk. We heard Chickadees along the way! We talked about school and selling Girl Scout cookies this weekend. The girl's school has "Imagination Fair" next week... kind of like a Science Fair. 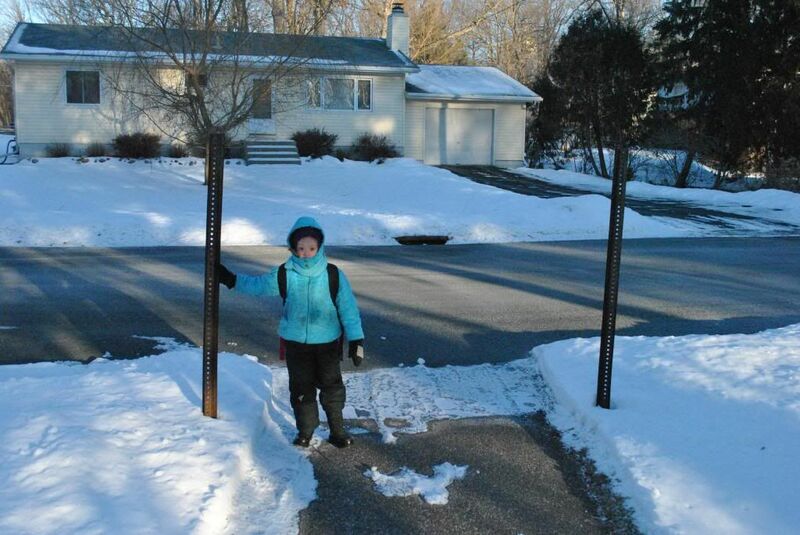 Maeve's project will be finished along Emerald Drive (the walking path she is standing on in the picture below). So we talked about that, and imagined what it will look like when it is done. Maeve is showing us where her Shirley Hills Imagination Fair project is going to be installed next week. A small neighborhood beautification project she is working on. The girls were clearly comfortable, and not in a hurry. 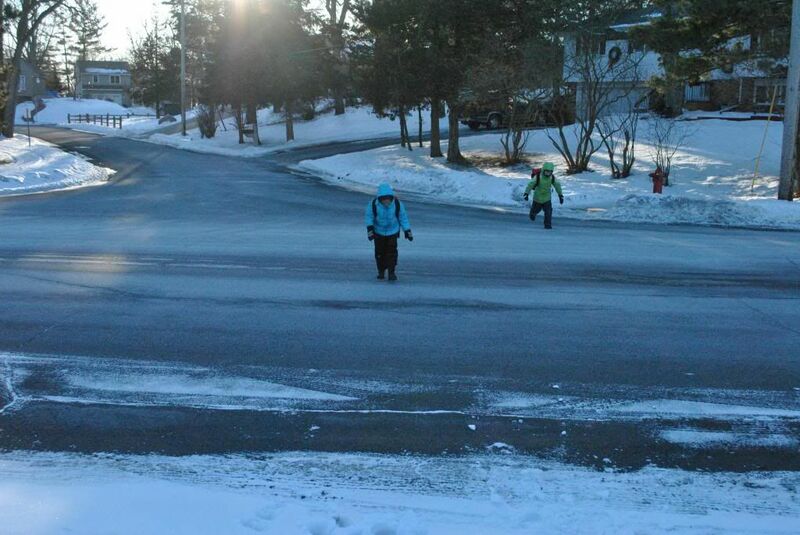 There was an extremely cold day a week or two ago where I truly worried if it was too cold to send them walking. I had an appointment to drive to shortly after they left, so after a few minutes, I got into my car, and as I was on my way to my appointment, I drove by the school to be sure they successfully got to school. They had not gotten as far as I hoped and appeared to be walking in circles in the Shirley Hills field! So I parked by the school door as they were finally walking up to the door. I asked them if they were ok, and they looked at me like I was crazy. "Yeah, were fine." They said, and walked into the school like it was any other day. After that, I decided not to worry about these really cold mornings. Especially when the weather forecasters are clearly telling us to be sure to bundle up. Yes, this is kind of dangerous. I tried discouraging this for a while last year, but then realized this is one of those time honored kid traditions that they will not be denied. If there is a lesson they will have to learn, they will learn it the hard way. Not a whole lot of traffic on Bartlett this morning. A couple of cars that were driving too fast as usual, one kind of slowed down as my kids were waiting to cross. The more I think about the way the "Safe Routes to School" program has been implemented in our community, and more shortcomings I see in it. This is something that needs to be addressed. Crossing our neighborhood stroad (Bartlett Blvd). Getting across the Shirley Hills field, my daughters were still not in a huge hurry. Maeve walked a bit through the playground, Cecelia took us on a tangent to show me something. Cecelia showing me her "Construction site" at the playground. It was fun to see someone had been playing out here. There was a snowman, and several large snowballs. 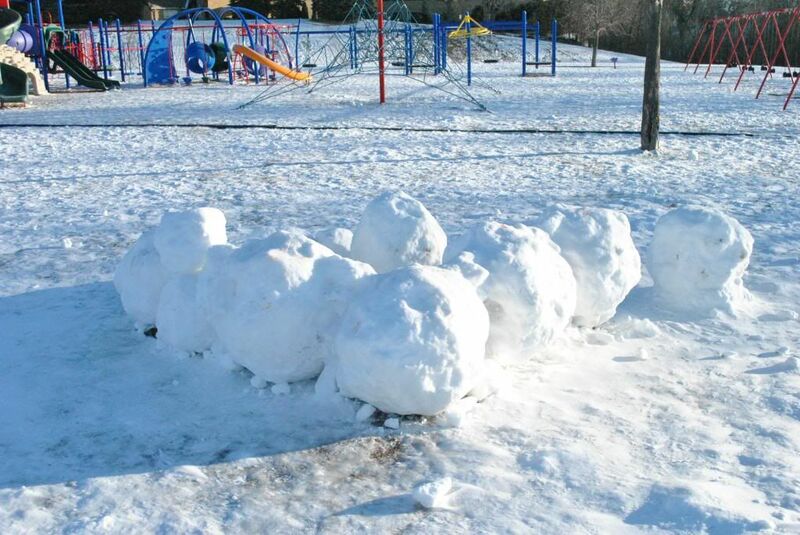 A snow fort on the playground. After seeing my daughters into the building, I turned to head by home, and saw a friend parking his car to drop off his preschool aged daughter. She didn't have proper head gear, he was in worse shape, without gloves. 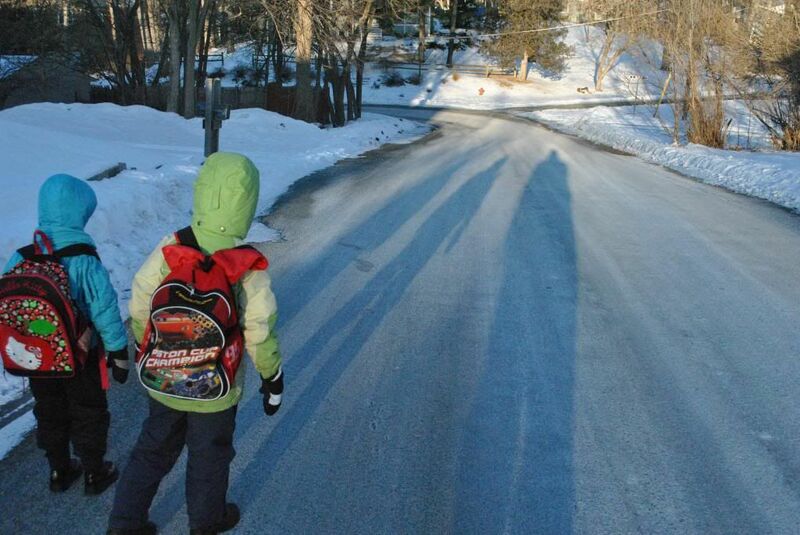 He knew we had just walked to school, and he just shook his head, said hi, and hurried into the building. This all reminds of a guy I knew a few years ago who worked in construction. When Fall was turning to Winter he talked about purposely stay out working a bit longer, not putting on gloves, keeping lighter jackets on, delaying turning on his furnace, and letting his body adjust to the cold. He strongly felt our bodies adjust to these temperatures if we let them. So when it would get even colder, his body was better prepared to work well in that weather. 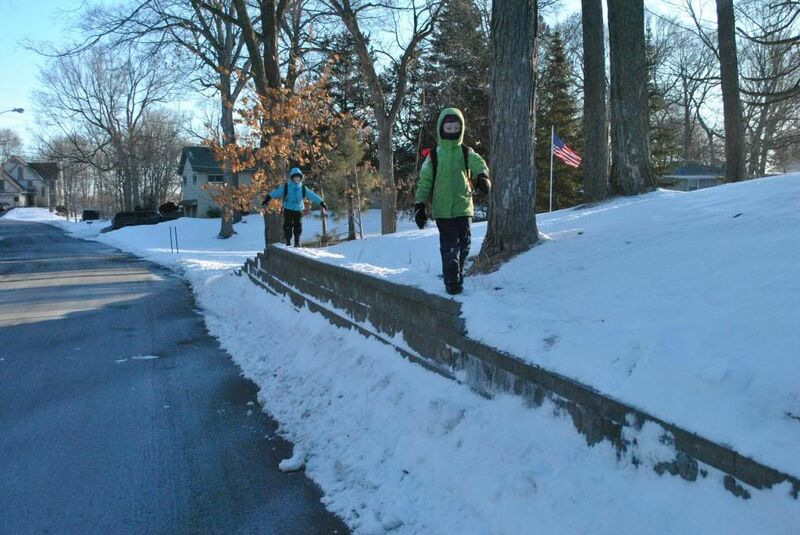 Even though the school is not letting kids out for recess or Phy ed, my kids are walking every day, and they are used to it. It's clear they enjoy the walk, and it is part of their routine. I am proud of them, and their attitudes about this, and am glad to continue to support their efforts. Way to raise true Minnesotans! This kind of weather used to be normal. Now people get all freaked out. Dress for the weather and you'll be fine. That sends a great message to your kids, and they get a lot more out of the walk than a car ride. Love the wall shot too, a good reminder not to let our kids live in an overprotective bubble. Thanks for the good read. It all comes down to being prepared for the situation. Saturday Night in Downtown Mound!